Bootlace is an iOS application for jailbroken Apple devices that allows the installation and configuration of the open source bootloader OpeniBoot and Android based operating system iDroid. Bootlace is programmed natively in Cocoa Touch and runs directly on the iOS device requiring only an internet connection. Currently Bootlace supports the iPhone, iPhone 3G and iPod Touch 1st generation. You can install Bootlace through Cydia as it’s hosted in the BigBoss community repository. More information can be found on the iDroid Project wiki here. it is not working on my iphone right now it says “unable to contact update server ” Is it down or close cause of piracy……….. I don’t see how it can be down due to piracy. Bootlace contains and does nothing illegal. Bootlace.me domain is working fine for me. Keep this project alive, please fix sources! same to me ! !i think this link is disabled in India ?? i have jailbroken my ipod touch and it has cydia but when i try to add the source http://repo.neonkoala.co.uk it gives me error after URL verification. Any ideas why am i getting this error? You don’t need http://repo.neonkoala.co.uk source anymore. It’s not used anymore. does it work with 4.2.1? Is there a way? Then what source do i add?? http://repo.neonkoala.co.uk it gives me error after URL verification. You don’t need this repo anymore. Everything is on default repos. i have jailbroken my iphone3g touch and it has cydia but when i try to add the source http://repo.neonkoala.co.uk it gives me error after URL verification. Hello, when I try to start bootlace up, it flashes a loading screen. I am using the iPod touch 2g, 8gb model. Read the requirements next time. iPod Touch 2G is not supported. how i download it ? are you going to add iphone 4s support any time soon? Nope. There’s no port of OpeniBoot for A5 devices and won’t be for a long time. No, there is no port for A5 devices in progress yet. I know this is pretty old, but I can’t seem to get it working on my iTouch 1g. I honestly don’t remember what I used to jailbreak it (may have been iSpirit), and bootlace is giving me an error: “Kernel doesn’t match any compatible jailbreaks”. Is there any (more or less safe) way to mask that from the program? The check is there for a reason. Just run the redsn0w jailbreak over the top, no need for a restore. where is redsn0w on top ?.. what about the ipod touch 4th generation? will this be added soon? It says that the firmware could not be downloaded. I am having the same issue as Neal. After Jailbreaking an iPhone 3g using redsn0w, installing Cydia, then Bootlace, I can install OpeniBoot just fine; however trying to install iDroid stops at the “Installing” screen at about 80% with a spinning wheel. The dialog is “Resolving Dependencies…” I’ve let this run for several hours before quitting the app. I’ve tried resetting the phone to factory defaults, re-jailbreaking it, re-installing Bootlace 3 times now, only to get stuck at the same spot. You can make bootlace supported with iPod touch 2g ?? Hi , how can i put android on my ipad2 16Gb. How can I install android in my cell I’ve 3g 16gb? can i also download apps from the android market if i run bootlacE? You are not giving answer to the questian, if “You don’t need http://repo.neonkoala.co.uk source anymore. It’s not used anymore” then what is next?, which repo? So what;s the next step then please? Hi , just downloaded bootlace to my touch 1g , jailbroken with redsn0w … I tried to install iboot ( version 0.2) but then it said that there was a problem with tetreiving the firmware from apple! What can i do? I have iPhone 2G sn0wbreeze jailbroken, does this work for me ? Honestly i know how hard it is to have people who know nothing about what goes into things asking for help so i hope this gives you insight into what the smarter people on the internet are thinking about. Recently (within the past few weeks) a very early build of open i boot was released for the ipod touch 4g on the idroid website and on the github. Since it also has the android kernel ported when the gingerbread/ICS port comes out for it how long will it take for you to create a bootlace for it. (as the current bootlace wont even build in the newest Xcode) Or will we just have to install it the old way through ssh and terminal. 😛 THX! Oh yeah and also have you guys contacted Erik Kristiansen about his work in dual booting windows mobile and iOS? maybe open i boot could also support windows mobile for even more awesomeness! but of course that would also require at least 1-1.5 less free space on the iphone so it wouldnt work on 2g/3g/ipt1g. OK, I’m Sure you are a busy guy and all, but i can’t for the life of me figure out why bootlace won’t run… I have a 16GB ipod touch first generation on iOS 3.1.3, jailbroken with redsn0w 0.9.14b2. I try to launch bootlace and all it says is “Kernel does not match any compatible jailbreaks. Jailbreak with redsn0w or PwnageTool and try again.” Please help! Yes the issue you are having is actually quite common. It is a problem with the bootlace firmware checker that normally would just make sure its not on a newer version of iOS. My suggestion is downgrade to iOS 3.1.2, jailbreak with blackra1n and try again. It says that it cannot connect to update server and to check my network connection meanwhile its perfect connection. Any suggestions? Is there a version for ipad? It says its not compatable. when i am going to http://repo.neonkoala.co.uk then error is this url is not verified.. so how can i install bootlace…?? after installing bootlace when i try to launch it showing message ‘cannot connect to server check internet connection’ but my internet is always on. 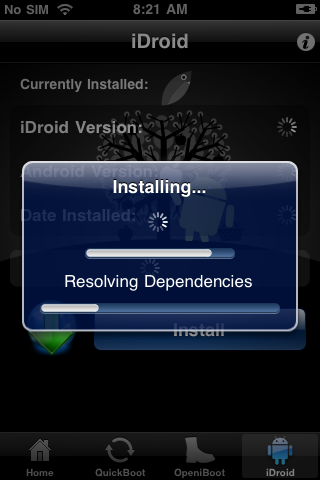 stuck at resolving dependencies when installing android on iphone 3g 4.1 wit bootlace.how to fix t? i have a iphone 3g and have ios 3.1.3 . I downloaded open iboot . after that i tried downloading idroid and it said something about md5 sums. I have a Iphone 3g and i have redsnowed it and installed bootlace without the neonkoala and i have installed openiboot but when i go to install idroid it says the MD5 checksum dosnt match. at first i thought it was cuz i used snowbreez but this has happend both times. GUYS! BOOTLACE RUINED MY IPHONE 3G. i CAN’T EVEN TURN ON MY PHONE ANYMORE! CAN ANYONE HELP? Md5 Checksum not match iDroid to download on iphone 3g 🙁 why? Hey. Iam using iphone 2g ,and i want to run android on this device. I have already tried bootlace,but at the time of installing idroid it gives me error”md5 checksum error” . I have done it several times but i havr not succed in it. What should i do now? Plz help me. i was trying to install iDroid in iPhone 3G 4.1 with the help of Bootlace,(i installed Bootlace from Cydia) but during the downloading process of iDroid with the help of Bootlace it shows some problem so i tried to restart the iPhone and after it switched off its became unresponsive.. !! no combination of buttons is working neither it is detecting in iTunes. it seems competely dead. pls suggest what to do ..
Today I tried to install Bootlace on my iPhone 3G iOS 3.1.3 jailbreaked with Whited00r 6. After install, I downloaded OpeniBoot and I restarted the phone. After turn off, the iPhone doesn’t turn on, and iTunes doesn’t recognize the iPhone. When I try to install open iboot it saysfirmware could not be retrieved from apple. When I install android it says idroid md5 checsum does not match. PLEASE HELP ME!!! I bought a 1rst gen iPod for nothing now????!!!! Fix fix fix!!!!! ASAP update every thing please or it won’t work on anything!!!!!!!!!!!!! I’vevdownloaded bootlace from bigboss repo (default). But when I try to download openiBoot I get error says sometjink like it can’t fetch my firmware. Please help! PLEASE HELP ME!!! When I try to install openiboot it says could not retrive firmware from apple. Everything else works. Please fix I bough an iPod 1 just to do this please!!!!! I already have 3.1.3 installed on ipod. please help me how to get over it. It shouldn’t be doing that. Use redsn0w 0.9.4 to jailbreak. You shouldn’t have any problems. RESOLVING DEPENDENCIES it dont goes on please help me! Jailbrake redsnow .94 on 1st gen ipod touch on iOS 3.1.2 , most recent Cydia has been updated with no issues. Bootlace will not install as it states I must upgrade to compatible dependencies iOS 3.1 or higher. Is there a fix for this?, cheers. My email will only be up for 24 hours. Hi. iPhone 3g on ios 4.2.1 stuck at resolving dependencies. What can I do now?? Thanks! How soon can we expect a working bootlace-version on Ipad 4? The original iPad isn’t even supported, so at the rate of things now, I’d say 4 years. I, too, am having trouble with this. I am getting the “Install failed. Firmware could not be retrieved from Apple” error. I tried poking around into the filesystem, and tried to see if I could find the link in the code in which it tried to pull the firmware from. I could not find any links. I am also having trouble installing OpeniBoot on the computer. When I follow the guides, I am missing several files that are nowhere to be found. Ugh! Hello! I have iPhone 3GS. When make support for this devise? It still works the procedure? because when I try to install openiboot says “install failed. firmware Could not be retrieved from apple”, how can i fix this? I’ve jailbroken my Phone with redsn0w. My phone is running 4.2.1 8C148. My phone is running 4.2.1. Any idea how to tackle this issue? Hey can you make it support for ios version 7.1.1 please I beg you it is me aim to have andro and ios running in my iPad mini please make it compatible please!!!!!!!!!!! I made a bootlace fix, I rebuilt Bootlace, changing some broken adresses. Hey can you make it support for ios version 7.1.2 please I beg you it is me aim to have andro and ios running in my iPad mini please make it compatible please!!!!!!!!!!! thanks for everything. people are lazy and stupid. read before try. think before question. if you can’t follow a simple direction don’t do it. this is way jail braking and idroid is almost dead for people who ask this type of thing whiteout even say thanks. again thanks for all the work the idroid team make. Hello, if you’re like me and your iPod or iPhone went comotose after something happened. E.g screens off, won’t turn on, stuff like that. I was able to get my iPhone back and running. When i install on a ipod 1 3.1.2/3.1.3 iboot has an error downloading. Installing Idroid Has MD5 Mismatch. para todos aquellos que tienen ERRORES!! deben leer todo lo que los usuarios comentaron se darán cuenta de que hacer Saludos. Would love to see/hear if there is some hope for support for the first gen iPad to run android. Do not have much spare money so would help me out a lot.